Remixing the look of a Tesla can be subtle or bold. Many of the most eye-catching Tesla mods are prowling the streets of South Florida after leaving Signature Custom Wraps. And often the most stunning Tesla transformations are found on social media. I recently stumbled across an especially striking Tesla from a Model 3 owner in California's Bay Area with the handle, Unmatched Tesla Model3, on Instagram. 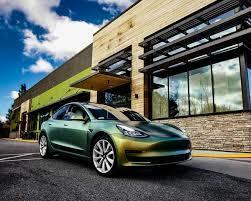 So in order to celebrate St. Patrick's Day today, instead of just drinking a pint of green beer, I wanted to showcase a stunning green Tesla. It turns out that the Model 3's owner, Isaac, actually works for Tesla and told me that the car's unusual vinyl wrap actually changes color depending on the light source.